In brief: Because of course I'm super happy if I'm eating sausages. One half of us, the Y half, will be posting from Nuremberg Germany for the next two weeks, working remotely from a rented apartment in the city center. Which also means, the only thing you will see for the next two weeks will be these Nuremberger Rostbratwurst, small thin grilled sausages unique to the city of Nuremberg. For 3 € you can pick up three tucked into a hard roll on almost any street in center city. They are everywhere. I've had one every day. 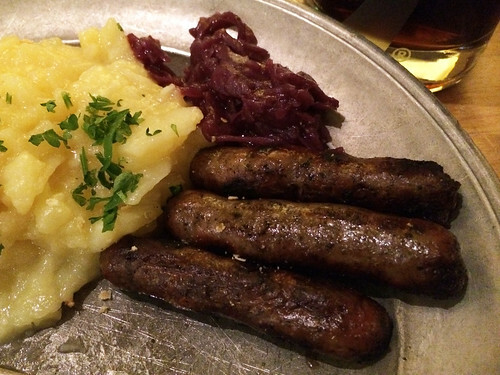 Last night we went to Bratwurst Roslein, very typical German fare, and I had a plate of them with a mushy potato salad and warm red cabbage kraut.